Is San Onofre a terrorist's target? Below are two articles about insider-sabotage at nuclear plants from Philip D. Lusk's Know No Nukes' weekday daily briefing for July 22nd, 2011. The first paragraph of the second article is particularly chilling to those who live around San Onofre, Indian Point, and a few other "choice" reactor sites. If San Onofre were shut down, sabotage would immediately be much more difficult, and get more difficult as the fuel cools. Only a relatively small security team would be needed to guard the waste (it's classified just how many that would be...). Their backgrounds would, presumably, be very carefully checked. Practically the only "expertise" needed on the site would be expertise in guarding things. Not high-pressure thermodynamics, fluid dynamics, hydraulics, metallurgy, electronics, electrical systems, computer hardware, software, network security, nuclear engineering, and all the other various people who are vital (and who must do their jobs faithfully) to keeping a nuclear power plant operational and safe. Special inspections would still be needed regularly, and when the waste is finally moved somewhere, guess what? There aren't enough experts in the world YET who really know how to do THAT safely. But letting the used reactor cores just sit there -- in pools preferably, NOT dry casks -- isn't as dangerous as having operational reactors in California, or recently-removed spent fuel. There have been terrorism threats against reactors worldwide, including ours, for decades. That further terrorism attempts against American nuclear power plants are coming seems inevitable in light of last week's reports, as if prior reports and incidents hadn't already made it clear. Based simply on random chance, there's about a 2% chance it will be San Onofre. Based on many other factors, it might be 10 times more likely. In fact, San Onofre might be TODAY'S TARGET. 9-11 was a tragic and colossal failure to stop an insane plan. The insane plan worked that day. There were warnings, and clues even months earlier, and the actual acts of demonic violence could have been minimized by shooting down, say, the second plane, or the third... but no one acted fast enough. In a nuclear accident, fast action by hundreds or even thousands of people may be all that will stop a catastrophic tragedy. It is possible that the fourth ("Shanksville, PA") plane on 9-11 was heading for Three Mile Island (one is hard-pressed to figure out what else the target might have been) and only the actions of a few heroic citizens who stormed THAT cockpit saved us from a meltdown that day. If that's true, then the insane plan that worked, didn't really work at all. Damage WAS minimized, because a few alert citizens didn't wait for government action. Nuclear power plants will ALWAYS be targets, and always have been, as the book Nuclear Power Plants as Weapons for the Enemy by Dr. Bennett Ramberg explained, in the 1980s. It's time to get rid of San Onofre and Diablo Canyon. They are old and dilapidated. They are terrorist's beaconing beacons for wreaking catastrophic blight -- death and suffering -- on Southern California. They are not necessary; their power production can easily be replaced by other methods, and have been, virtually, many times in the past. In one 14 month period not too long ago, for example, California added more generating capacity than all our nuclear power plants combined produce. So really, it wouldn't be that hard to replace that power with alternative energy sources -- especially conservation. Instead, the power plants have continued to operate despite the fact that they are falling apart at the seams (literally, and elsewhere). Their biggest success -- upping their "up time" to 9 hours out of every 10, on average (not particularly good for "baseline," especially when they tend to fail during natural disasters) was accomplished NOT by greater skill, efficiency, and "togetherness" on the part of the workers as they claim, but by increasing the enrichment of the uranium-235 to approximately double what it was when they started operating the reactors here, and then shutting down for refuelling less often. One result is that, pound for pound, our "spent" fuel is far MORE dangerous than it used to be, because when it comes out of the reactor it has accumulated far more fission products. Another result is that there is more radioactive and thermal "heat" in the spent fuel, which takes longer to decay to "safe" (I use the term VERY loosely) levels after the fuel has been removed from the reactor. It undoubtedly has more plutonium, pound-for-pound, as well. Nothing comes for free in the real world and it doesn't happen in the nuclear world either. We will all be paying for Fukushima in increased cancer rates throughout the planet. Animals and plants will all suffer needlessly from THAT tragedy. Here in California, such a tragedy is still preventable, but only by determined action by everyone who cares about our great state. The federal regulators have proven time an again that they would approve just about anything and call it "safe" even when it isn't. The utility will lie about anything (such as: "we do our fire rounds properly") and make up any story (such as: "there are ZERO emissions from an operating reactor"), and then say it's the public that's confused. If so, it's the industry's fault. Shut San Onofre. Shutdown before meltdown. The author has lived downwind from San Onofre for nearly 20 years. He had bladder cancer a few years ago (one known cause of bladder cancer is radiation.) He is a computer programmer. A recent federal report has raised alarms about the potential dangers of internal terrorist attacks at U.S. utilities, but a spokesman for Progress Energy Inc. says the Raleigh-based company has appropriate measures in place to protect itself and its customers. It s something, obviously, we take very seriously, Progress Energy (NYSE:PGN) spokesman Mike Hughes said Thursday morning. He adds that Progress conducts thorough background checks on all employees, including contract employees, and continues to monitor workers throughout their stay with the company. Some are subjected to psychological examinations. As for physical protection, Progress, and indeed all nuclear energy facilities, have ramped up security measures, Hughes said, to include more security personnel and better physical barriers to prevent a break in. Progress operates three nuclear plants in the Carolinas, including the Harris plant in Wake County. Hughes comments came in response to questions regarding a report titled Insider Threat to Utilities by the U.S. Department of Homeland Security. The department issued the report July 19 regarding potential threats to private sector utilities, according to Matthew Chandler, a department spokesman. While DHS has no specific, credible intelligence of an imminent threat posed to the private sector utilities, several recent incidents highlight the on-going threat to infrastructure in the utility sectors from insiders and outsiders seeking facility-specific information that might be exploited in an attack, he added. The report was supposed to be confidential, but was leaked to ABC News, which did a story on it Wednesday (SEE STORY BELOW). A Duke Energy (NYSE: DUK) spokesman did not immediately return phone calls made Thursday morning. Charlotte-based Duke, which is buying Progress for $13.7 billion, provides power in the western part of the Triangle. "DHS routinely shares information with its state and local partners on a wide-range of potential threats, and as part of this responsibility, DHS issued an intelligence note to its federal, state, local, tribal and private sector partners on July 19 regarding potential threats to private sector utilities. While DHS has no specific, credible intelligence of an imminent threat posed to the private sector utilities, several recent incidents highlight the on-going threat to infrastructure in the utility sectors from insiders and outsiders seeking facility-specific information that might be exploited in an attack," DHS press secretary Matt Chandler said. "We will continue to work closely with our state and local partners, including our partners in the utility sector, to take steps to best protect from potential threats including protecting our nation's infrastructure. This includes sharing information as well as best practices." If someone is determined, and has the right access, they could do damage that would affect thousands of lives," Sweet said. OH NO: Ace slips up on H2O2; The Zirconium Connection; Transuranics and Cancer. My worries about zirconium needed clarification as well. Fortunately, I recently discovered a terrifying document about zirconium in my files, written in 1979, which I had scanned on March 3rd, 2011, eight days before Fukushima. The Zirconium Connection describes precisely what went wrong in Fukushima, proving unequivocally one of two things. Either the nuclear industry has, indeed, been lying about the known dangers of using zirconium fuel cladding as the author suggests, or of course, they've forgotten, which proves that ANY safety improvements will, in fact, also be forgotten over time. Either way, the industry is a disaster-waiting-to-happen. Accompanying my copy of The Zirconium Connection, which was probably sent to me by the late Pamela Blockey O'Brien, were two other pages of documents. I've typed one of them in (the portion I have) called Transuranics and the Impact on Health, by Carl J. Johnson, MD, MPH, and have included it below. But why is there a complete dismissal by the NRC of any immediate indications of exposure to levels of radiation higher than what were immediately thought the first dates of the accident? Psychosomatically induced ailments are possible with some, but not with hundreds or even more persons and I suggest this matter has been conveniently laid aside. In light of the fact that right now, the National Academies (National Academy of Sciences, National Academy of Engineering, Institute of Medicine, National Research Council), "Advisers to the Nation on Science, Engineering, and Medicine", Nuclear and Radiation Studies Board is JUST NOW STARTING to undertake an assessment of the dangers, and is only at this time in the process of establishing the protocols, I'd say Reed's compliments that studies would be properly done were unfounded! 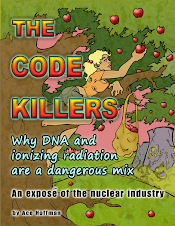 On page 31 of my 2008 book The Code Killers (available as a free download, see URL below) you will find a document supplied by Richard Webb, who studied Three Mile Island extensively and many other reactor designs (and worked at Shippingport, his career goes so far back), indicating that peak releases from Three Mile Island were "off scale" at least twice during the event, plus the recorder stopped for several critical hours when releases were probably off scale as well. Fukushima not only CAN happen here, Fukushima WILL happen here (unless we shut the plants down and start to properly protect the waste, and let it begin to cool). If we keep the 104 Light Water Reactors with their zirconium-clad fuel running, it's just a matter of time before Fukushima happens here -- BWR, PWR, GE, Westinghouse... it doesn't matter. Anyone who believes anything else believes blatant nuclear industry lies! Honest people correct their mistakes and I've tried to correct mine. The nuclear industry has had more than 30 years to fix THIS problem, and instead they've pretended it didn't even exist! Once you read The Zirconium Connection in light of Fukushima, I don't think you will EVER trust the nuclear industry again! >in your #7 paragraph you call an OH radical "hydrogen peroxide" whereas it's really a hydroxyl or hydroxy, the common chemical base or lye. Hydrogen Peroxide is H2O2, a completely different chemical. This is a very glaring oversight in that it opens your otherwise pertinent information to question by those out to discredit the anti-nuke crowd at every opportunity. You ought to be more careful. The following document accompanied my printed copy of The Zirconium Connection by Daniel M. Pisello, which was published in The Ecologist, June-Aug 1979. "Recently GPU [TMI's owner] and the NRC acknowledged that the core of Unit 2 at TMI reached a temperature of 5,100 degrees F and that transuranic materials were released into the environment. Below is a statement that was part of the May 28 press conference in Washington D.C. sponsored by the SVA"
A typical nuclear reactor like TMI-2 has about 97 tons of uranium 238 and 3 tons of U-235. Although some reactors are also fueled with plutonium, all operating reactors make large amounts of plutonium. A typical reactor in a year will produce 100,000 to 600,000 curies of alpha-radiation emitting plutonium, 7,000 to 110,000 curies of americium, and 400,000 to over one million curies of curium. Each curie will exceed the Department of Energy's (DOE) maximum permissible body burden for 24 million nuclear workers, or 2.4 billion people. This DOE exposure standard does not protect workers, however. At Rocky Flats, nuclear workers with less plutonium in their bodies than permitted by DOE had sharply increased rates of chromosome damage, even at only 1% to 10% of the permitted dosage of plutonium. Put another way, a teaspoon of plutonium-238 would exceed the DOE exposure limit for 40 billion nuclear workers, or 4 trillion people, and even a small fraction of this maximum permissible dosage will cause severe chromosome damage. There are about 40 transuranics of importance, like plutonium 238, produced in all nuclear reactors. Some are somewhat less toxic, some are more toxic. Plutonium and similar radionuclides occur in all tissues in the body in man, and become a permanent resident in the body. The excretion rate is very slow, about one-half would be excreted every 200 years. In animals, plutonium causes cancer of the lung, bone, kidney, mammary gland, lymph nodes nesothelium, and ten types of soft tissue cancer. In one animal study, plutonium caused a cancer rate of 114% with a mean induction period of about one year. Many animals [had] two different types of cancer. Excess cancer incidence has been reported in Rocky Flats workers and in the population living downwind in Denver. The children and young adults in Arvada and the area near the plant in 1957, when an explosion blew out the filters at the plant, had a greater than four-fold excess of leukemia in 1969-1971 at the time of the National Cancer Institutes's Third National Survey of Cancer Incidence. I estimate that the Rocky Flats exposures will cause more than 12,000 excess cases of leukemia and cancer in the Denver area between 1960 and 1990, and a somewhat greater number will be affected by birth defects and non-specific effects on health. This was the only Federally-supported study of cancer incidence around a Federal nuclear facility. An Environmental Protection Agency (EPA) report states that a nuclear reactor can routinely release over a million curies of fission products in the exhaust each year. These routine releases include 6.8 curies of neptunium, a transuranic. I asked the EPA regional radiation officer why the release of the other 40 plus transuranics were not reported, and he said, "that would not be self-serving to the industry." "The fission yield of iodine-129 is about 1% and the yield of iodine-131 is close to 3%. That is, about one atom of iodine-129 and three atoms of iodine 131 are produced per 100 fissions." "The trouble-free life is 8 years. The lifetime of the PHAR is 30 yeas. The lifetime of the PHAR autocatalytic modules is 5 years. The PHAR should be placed under the dome. General maintenance every 5 years. Regenerating time is no more than 50 hr." Great song in any language!!! Published: July 11, 2011 Updated: 1:39 p.m. Ask the Mayor: Is tritium from San Onofre reason to worry? Tritium, a radioactive form of hydrogen, has not been detected in the ground, water or air in San Clemente, Lori Donchak says. The city shut down its water well at the south end of town in 2006 to test and confirm that tritium at the San Onofre nuclear power plant couldn't get into the well. A resident wants to know if there's any danger to San Clementeans from tritium leaking from the San Onofre Nuclear Generating Station. It's one in a series of questions posed to San Clemente Mayor Lori Donchak on her Mayor's Blog at san-clemente.org. San Clemente shut down its water well at the south end of town in 2006 to test and confirm that tritium in groundwater where the San Onofre nuclear plant's Unit 1 reactor was located couldn't get into the well. MSNBC.com reports that three-quarters of U.S. commercial nuclear power plants leak radioactive tritium. As a longtime San Clemente resident, I'm seriously concerned. I'd like to know if San Onofre is one of them. Being the closest city to San Onofre nuclear plant, does our city have any oversight on the safety of the nuclear plant? The Nuclear Regulatory Commission is the federal agency with oversight over San Onofre. Despite our proximity, the city of San Clemente has no legal or regulatory influence on the operation of the plant. As you may know, tritium is a radioactive form of hydrogen that occurs as part of the operation of a nuclear power plant. Tritium particles pose a potential radiation hazard when inhaled, absorbed through the skin or ingested through food or water. The city's emergency planning officer, Jen Tucker, is familiar with tritium and indicates that testing for it and other contaminants is done regularly. She says tritium has not been detected in the ground, water or air in San Clemente. In 2006, there was evidence of tritium in groundwater where San Onofre's Unit 1 was located. At the time, the city shut down its only well until extensive tests were completed that showed that water at the plant couldn't migrate to the well and that the well was free from contamination. Jen says questions about the current monitoring program can be sent to nuccomm@sce.com. Tritium and contamination are also addressed on the NRC's website, nrc.gov.